Every custom piece represents a journey. Our skills and your ideas allow us to execute your piece; infusing longevity, value, and style. We’d like the chance to transform how you think about jewelry, by restoring a precious keepsake or realizing a truly imaginative custom vision. We have an incredibly talented team who is committed to creating an unforgettable experience. Consider scheduling an appointment today. Your free design appointment is a time for us to answer your questions, familiarize you with the design process, and provide you with all the information you need to create a piece that will be both functional and beautiful. We will estimate cost and feasibility, and will promptly follow up regarding production consultation and research results associated with your design. We love a challenge! Following your approval of these elements, we will begin to transform your idea into a reality. How great is this idea? A hand written note with our client’s voice, written in the best penmanship by one of our designers on a paper with heavy nap and life to it. 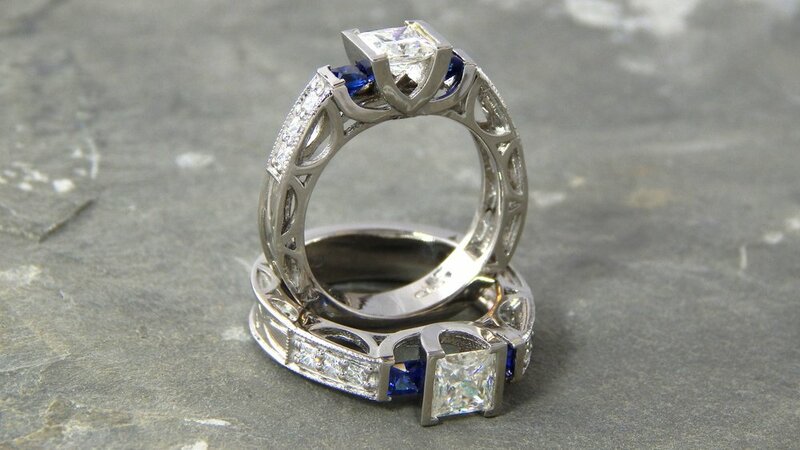 Folded and enclosed in a pre-engagement ring, allowing the recipient to design their ideal ring. It’s one of the many ideas that grow from a free design appointment. 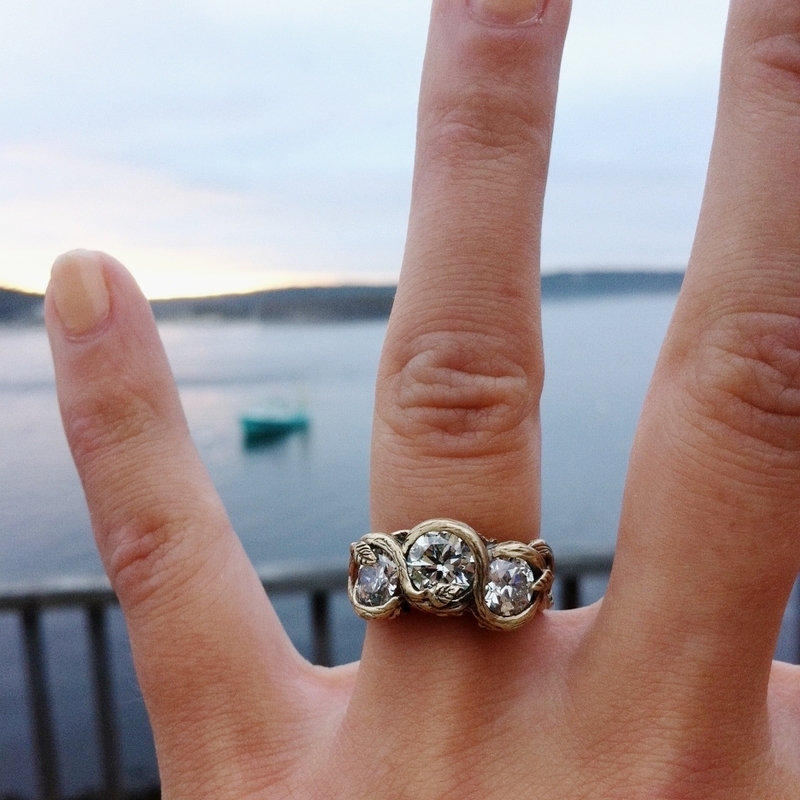 Custom design begins at $200 plus materials and options when making one of our rings your own. Total free form starts at $485 and so on. Average total job cost at Darvier during 2018 was well below the national average of $6324. Additionally, but not necessary, many of our clients have family stones or old unwanted jewelry to contribute to the cause that dramatically lower your out of pocket expenses. We are very receptive to your budget and style and our staff is not on commission. Don’t forget: This is about you and your relationship, not what a report says you should spend! Adhering to the Kimberley process of fair trade is the priority for all diamonds sold at Darvier, much like adhering to GIA standards of diamond grading. While gem quality diamonds are a large part of our industry, we are proud to point you to the various directions a diamond can be had. Diamonds are presented in your design appointment from the perspective of education first. I’m sure you may have heard a few parts of the 4C’s. Here is your opportunity to ask those who work with diamonds first hand in assisting you in finding the beauty in your chosen characteristics. Your personal balance of rarity and value presented in an environment free from pressure or commission. That part may be in a diamond mined in Canada over the watchful eye of a nationalized fair trade industry. It may be in a lab grown diamond where the prices continue to drop as production and perceptions change in favor of modern influence in jewelry. It may be a hand cut vintage diamond that has lived many lives before your enjoyment. Thousands of loose gemstones of every type and shape are on display in our showroom to select and inspire your designs. Frankly, I have a gemstone problem. But it’s a fun problem to have the opportunity of showing you every species of gemstone suitable for daily wear. We have had first-time clients inquire about rare and unexpected gemstones as a litmus test to our seriousness in the jewelry industry. We have a few examples of most any stone you can imagine. Most any stone you’ve heard rumored to exist. A couple of the staff at Darvier excel in this field and will be happy to sit in on a design appointment and ramble on about refractive qualities and Mohs hardness expectations vs. realities for your project. GIA standards of color communication and authenticity are hallmarks of our independently verified and appraised gemstone collection ensuring fair market pricing at Darvier. This is your opportunity to view your piece as it will appear in metal. Via email images or appointment, we will show you a computer or wax model. The computer render is used for expediency and clients that cannot visit our studio in person. Sometimes it is the best way to show complex stone settings or metal choices. We also produce prototypes like this freshly cast TriForce design for you to see the proportions in your hand. Whether they are 3D printed, hand carved or machined, your design dictates the creation method, whichever best expresses your design. In this case, 3D printed for the win. At this stage, we invite you to discuss any changes with your designer. We welcome your discerning touches, we want you to be excited about making your custom project your own. A process that does not allow for a prototype as it is often milled in the material chosen. But the design will be presented to you during your appointment as an actual size drawing illustrating the chosen materials. Turned on a CNC lathe to your exact specifications. Often gold, sometimes titanium and meteorite shown here with a tension set wee diamond. Chat with a designer about the super long list of materials and possibilities available for custom machining your ring. p.s. Darvier does not work with Tungsten. It is a very brittle ceramic alloy that must be shattered off your finger in case of emergency. Not a great experience having an EMT crack your ring off when adrenalin is racing through you. Nope. Most major suppliers are also slowly discontinuing Tungsten. When computer designs find thier organic limit, we opt to carve your design by hand. One at a time. It is a great way to have old world artisanal craftsmanship in every aspect of your design. Hand carving takes time, but I am repeatedly surprised that it does not exceed our usual 6-8 week full custom turnaround queue. A testament to the exactness of our designers in communicating your design to the Darvier production team. Hand carving options start at $375. My favorite part. Often forgotten, it is the ultimate way to express yourself in addition to your custom design. 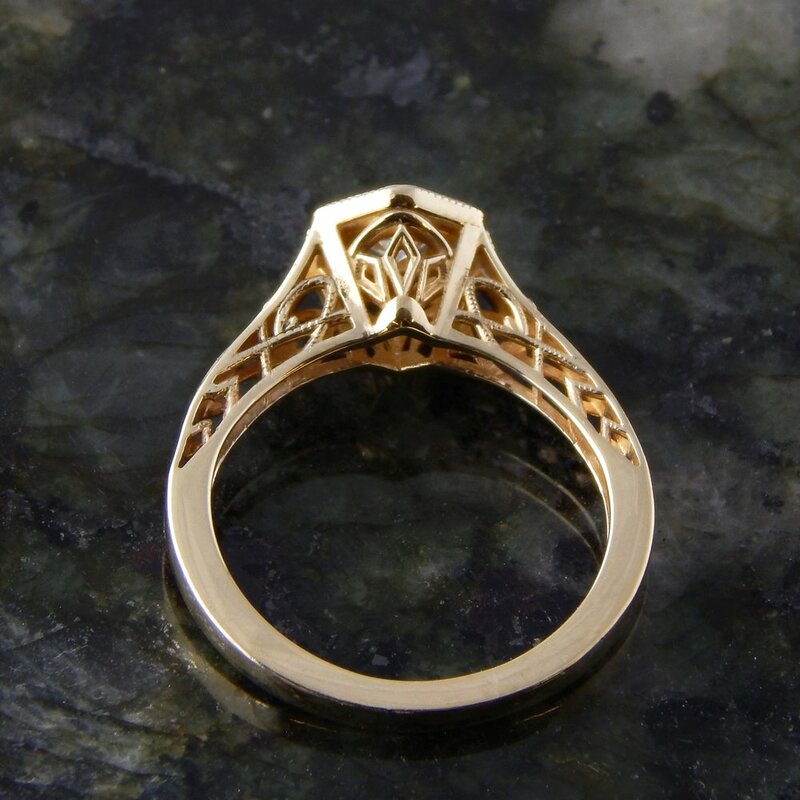 This Celtic design engraved on a ring for a client with the last name of (close enough) Swartz. We both knew what we had to do. Fingerprints, mountain ranges, topographical maps, location coordinates, anniversary date… This finishing step comes from the value discovered in your design appointment. Once we get to know you a bit, the ideas are hard to stop. Hand applied, a little different every time. The faceted finish you see here is one of a few dozen available. We love the rustic and deep textures possible that really gives jewelry its final touch. Using several methods, from traditional hammer textures to emulating Aspen tree bark, this is where designs feel like they reach total completion. Most textures are at no additional cost as we can get tired of polishing all day. A few are an additional cost. To get the flat hammer finish, for example, one poor goldsmith in our staff has to literally hit the jewelry with a hammer a few hundred times and make it look intentional and balanced. A quick mention to this method that is a cornerstone in Darvier jewelry production. Made to exacting standards, mixing repeatable techniques and metallurgy fact. Jewelry made by forging steel in the Damascus methods developed in Syria or by forging precious metals in the style of Mokume Gane from Japan, these are some of the most beautiful and durable heirlooms Darvier creates. The more it’s worn and ravished with wear, the better they look. It’s one of the only things we create that do not return for refinishing. They look amazing worn as the patterned design is throughout the piece and never wears away. Some of the black you see in Damascus is a patina that occasionally is refreshed, but usually only when we are asked to size them up a bit. This Mokume Gane wedding set was forged from 19 layers for our 14k rose gold and palladium combination. Discover how you can design a rare forged piece here. Capturing the vintage style in a new design you help shape. Taking design elements from the turn of the last century where rings were die-struck and assembled to create impossibly thin and delicate designs. Now, we 3D print the designs as one. Something impossible for goldsmiths until recently. This Art Deco design in yellow gold you can see the interior is carved away to expose the gallery giving the ring a visual lightness offsetting the heft and strength of the lower portion of the ring mitigating the most common wear issues. This is also an opportunity to hide icons and symbols that are important to you and your partner. Music notes, treble clefs, birds, dragon wings, and flowers are just a few you’ll see in our portfolio. 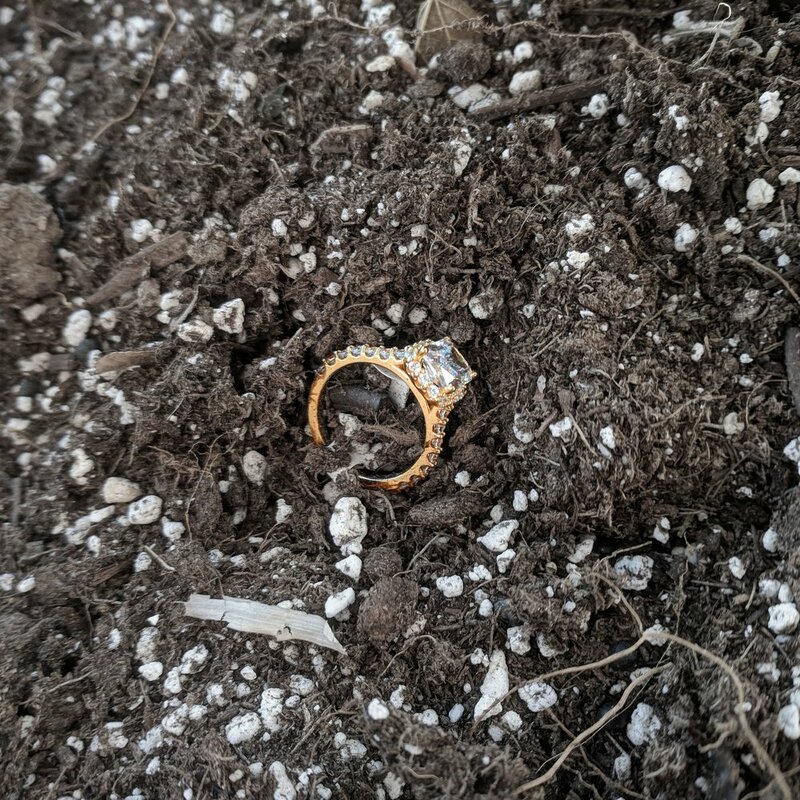 The impossible task of finding a ring that fits as it should with the apperance of never being without is a very straitforward project at Darvier. 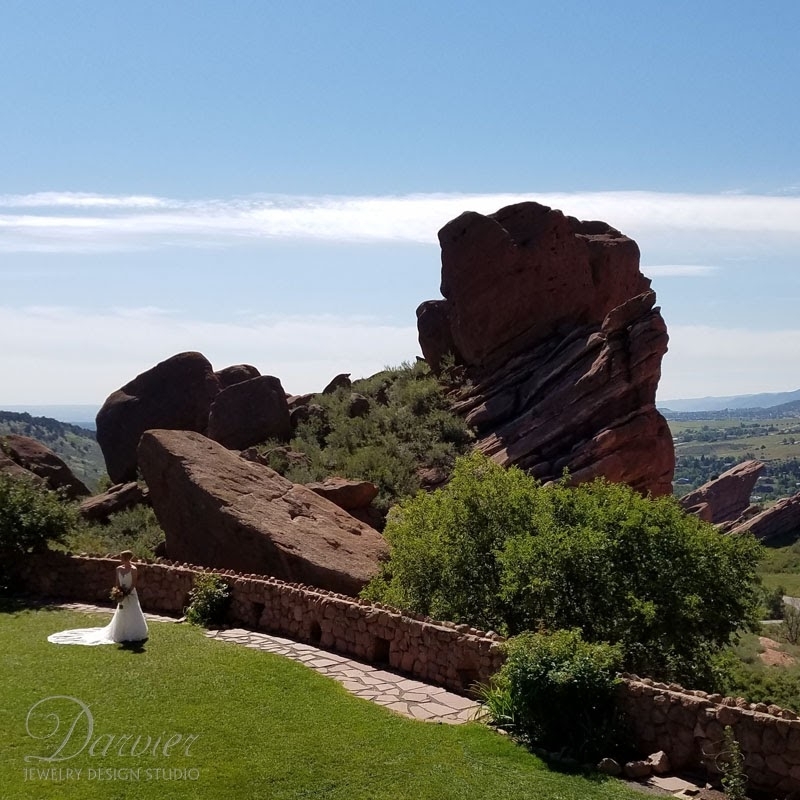 While we see many exasperated clients come through the studio looking for the ring that fits perfectly with their curvy engagement ring, it’s a difficult and lengthy task. May we offer an alternative? Thoroughly measuring a client engagement ring allows your designer the satisfaction of a perfect fit every time. This perfect fit is super important if you plan to wear the rings together. If the fit is off, the rings will destroy each other and put the stone setting at risk in a matter of a few years. Allowing for a little time and care will ensure your wedding set will last as any heirloom should. Custom fitting based on hourly rates. It’s not bad though, considering the damage it mitigates. Can you be allergic to your jewelry? We have heard all ranges of concerns and myths, “there’s no such thing as a nickel allergy” to “I’m allergic to gold”. All jewelry is an alloy of several metals. Let’s take 14k white gold, about 73% of our custom production. Here in the US, nickel is alloyed with gold to bleach it white. But it comes with a problem. Here’s a quote taken directly from research into nickel performed by the Center for Disease Control: "Approximately 10-20% of the population is sensitive to nickel. People can become sensitive to nickel when jewelry or other things containing it are in direct contact with the skin for a long time. Once a person is sensitized to nickel, further contact with the metal may produce a reaction. The most common reaction is a skin rash at the site of contact. The skin rash may also occur at a site away from the site of contact." Welp…there it is from the CDC, but we have the solution. Darvier has processes in place to test and create nickel-free white gold jewelry by request. The purity of platinum is another wonderful choice for those with nickel sensitivities. We also machine (and occasionally print) custom bio-compatible Titanium jewelry to order. Inform your designer if you think you may have a sensitivity to nickel. You have options! This is about your love, your origins that led you to our little shop. We love our community and the interesting client base it brings us. We want your voice to be heard and show how it translates into what we’re known for, your wedding set. Share your images with us to our Instagram! Share your experience on our Facebook page. 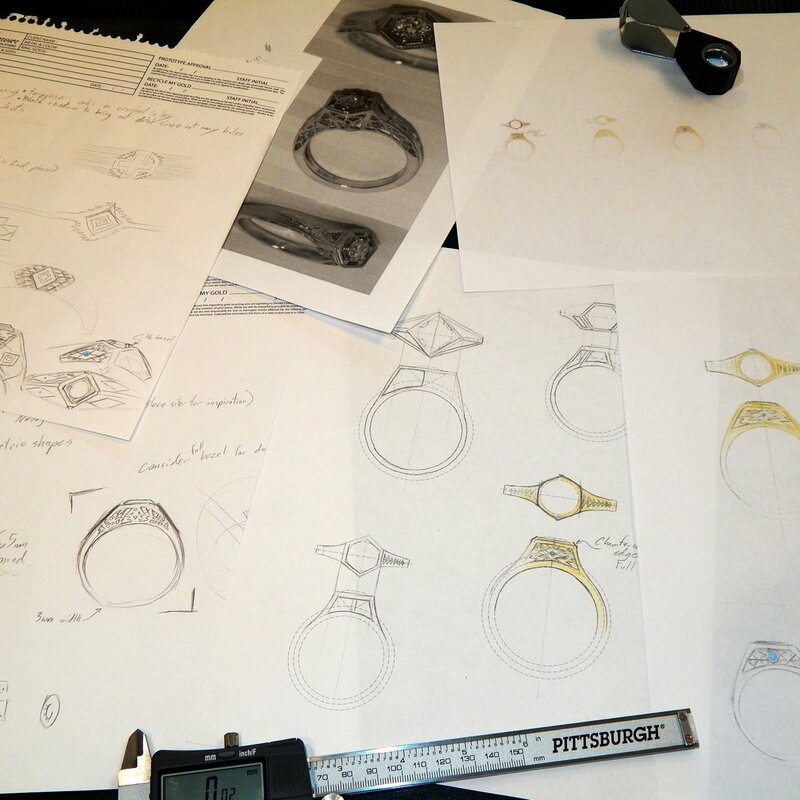 Join the thousands of followers in our story of custom jewelry at Darvier. In our low pressure and relaxed design studio, don’t forget this is about you two and we are here to listen to your story. We are here to enjoy your personality, thank you for bringing it with you to your design appointment! Your designer will listen and reflect your taste and style into the very first steps of the Darvier custom process. Your design will have the foundation of your unique twist on life. This experience is as stripped of ego as possible on our side, allowing you to be the designer. This observation in our design work creates a vacuum that your personality fills that cannot be hidden. As you know, personality goes a long way. Beyond your homeowners or renters insurance is additional insurance that goes above and beyond. We partnered with Jewelers Mutual to offer insurance above and beyond what you would expect. A free, no-obligation quote for anything that Darvier has a hand in making, restoring or selling is eligible immediately, before you walk out the door. Darvier trusts Jewelers Mutual for our own insurance coverage on the day to day. Please consider them as well. We will handle your claim, leaving you with very little to do to become whole again. This is worldwide coverage so your adventurous engagement is covered.